India’s annual inflation rate rose to a five-month high in July, according to a report by the country’s Commerce Ministry. 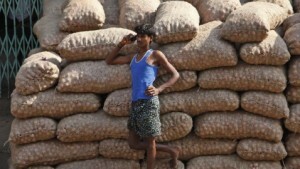 The wholesale-price index, a main gauge of inflation, rose 5.79 per cent exceeding June’s 4.86 per cent climb. The report said food prices climbed 11.91 per cent last month from a year earlier. India’s national currency, the rupee, has fallen around 12 per cent against the dollar since May. Onion prices have risen a staggering 145 per cent, with pressure rising on the government to halt exports of the vegetable. New measures include quasi-sovereign bonds by state-owned firms, relaxation in norms to enable banks garner deposits from non-resident Indians and an increase in import duties on non-essential goods like fridges and television sets. The Indian government also hiked the customs duty on gold, platinum and silver to 10 per cent on Tuesday.